Shirts With Random Triangles: Clemson Adds 5-Star WR Prospect Tee Higgins To Its 2017 Recruiting Class. Higgins has originally committed to Tennessee in August 2015, but decommitted from the Volunteers in January of this year. 247Sports grades Higgins as a composite five-star wide receiver. The recruiting website ranks Higgins at no. 3 among WR prospects for 2017, at no. 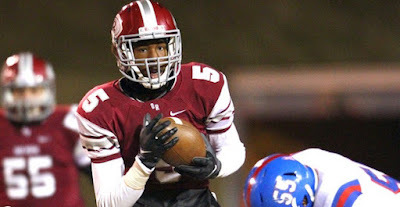 1 among 2017 prospects from the state of Tennessee, and at no. 15 in its national composite rankings for 2017 prospects. Higgins attends Oak Ridge High School in Oak Ridge, Tn. He stands 6'4.5, and weighs 188 lbs. Clemson now has eleven members of its 2017 recruiting class with the edition of Higgins.